Rupert and his identical twin George arrived at just under 24 weeks gestation in September 2015. Rupert was whisked away into the exceptional care of the hospital team and we didn’t get to meet him for his first five hours. George was born sleeping. We were able to share a precious hour with our darling son, cuddling him in our arms, and now, he is nestled forever in our hearts. George had sadly passed away in utero at 22 weeks, causing a period of oxygen deprivation for Rupert, who also suffered a bleed on the brain. 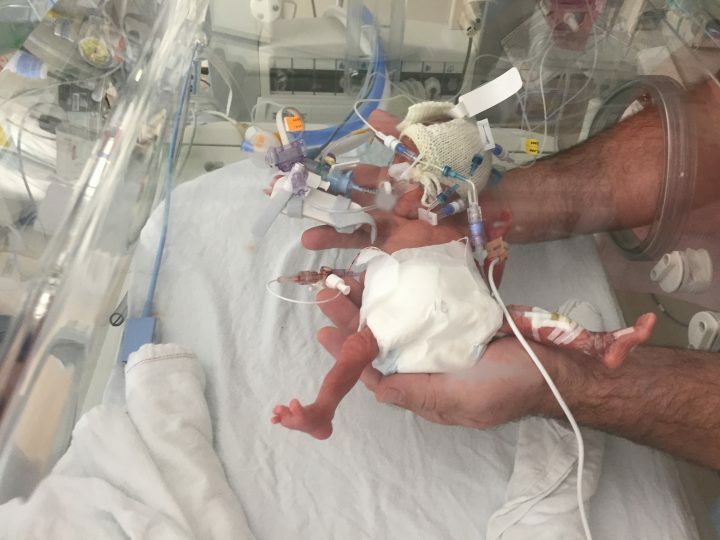 Rupert spent 142 long days in the neonatal intensive care unit (NICU) and then was transferred to our local hospital and their special care baby unit (SCBU). Rupert weighed just 813g/1lb 8oz at birth and this dropped to 709g/1lb 6oz a few days later. We watched our beautiful son battle the odds and fight every step of the way. He endured countless procedures: 5 weeks of ventilation, 8 or more blood transfusions, endless cannulas, lines, tubes and wires, heart surgery at just 4 weeks, a toxin producing skin infection, weekly invasive eye checks and treatment, and far too many needles, pokes and prods to mention. We weren’t even able to hold him during his first impossibly difficult 6 weeks. He was and is our beautiful, brave miracle. Once home, Rupert’s new journey began. He has been diagnosed with quadriplegic cerebral palsy (CP) with dystonia, the most severe form of cerebral palsy. He is also on epilepsy medication and is at risk of seizures. In addition, he has chronic lung disease, so is very susceptible to the slightest cold or cough. He had to have oxygen for his first few weeks at home, but thankfully he is now able to manage without this. Despite all the challenges he has faced, he is also absolutely gorgeous; big blue eyes, determined, cheeky and with a knowing smile. He is just wonderful. When we were in the NICU and were told the extent of his brain injury, we were floored by grief and sadness and with immense fear for Rupert’s future. So much is now unknown and will only unfold with each day, month and year. He may never walk or talk. He may never be able to carry out the most basic of motor functions and he may be cognitively also. We simply don’t know. The best advice we were given is that whatever happens, “he will be Rupert”. If he could, we are quite sure that he would himself be shouting from the roof tops “I am Rupert, watch me go”.